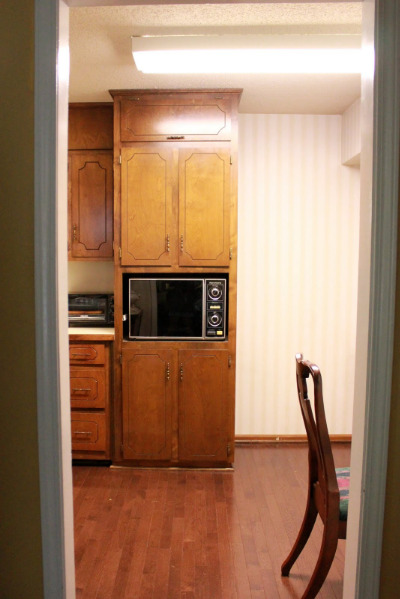 We recently had a client contact us about helping them update their kitchen. The couple didn't want to do a huge renovation or overhaul, just some ideas they could easily implement to give their kitchen a facelift. Lucky for them, our E-Design process was perfect for such a task! Lucky for us, they already had great bones to work with--an island, shaker style cabinets, a built-in banquette. They had also recently purchased these modern barstools and they wanted to know how to incorporate them into a more traditional style like the rest of their home. We loved the clean lines of the stools and were excited to get to work marrying traditional pieces with some modern touches. Here is what we designed. The lights over the island are a much cheaper version to Troy Lighting's Maidstone. It was a great fit for a beautiful style on a budget and wasn't too ornate for some modern pairings. 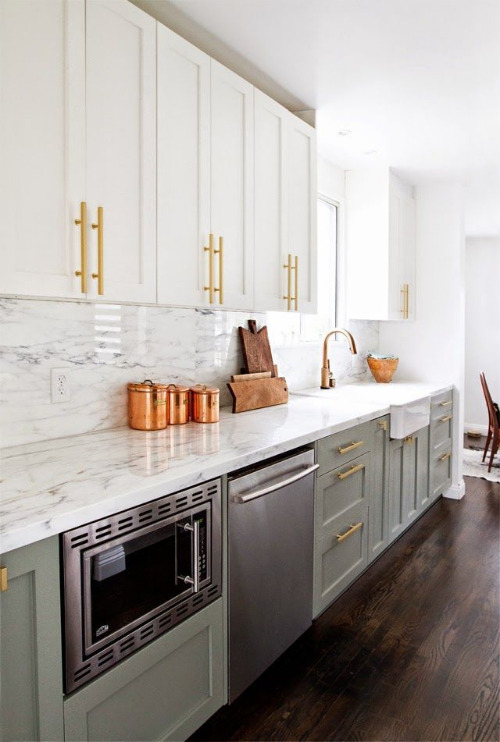 We suggested updating painting their cherry cabinets in Silvermist (SW-7621) and adding this brass hardware for more clean, modern lines. A good rule of thumb for hardware is pulls on the drawers and knobs on the doors. For the countertop we suggested this beautiful Torquay Quartz by Cambria. This was the biggest item in the budget, but it will last forever. It has the look of marble but with much less maintenance. They didn't have a backsplash before but were interested in adding one if they could find something in their budget--enter white subway tile. It's a timeless classic (that's why you see it everywhere), but it's also very affordable. For the banquette area we wanted to add in some fun color and pattern with these pillows in a fabric by Kravet. They add a playfulness to the space and soften the banquette which was previously just a wooden bench. We topped off the banquette update with this high-gloss, oversized cone pendant light with gold lining inside to add the perfect glow for conversation. We love how this kitchen turned out, and even better, so did the client! Kitchens are some of the easiest spaces to update with paint, hardware and lighting. If we can help you spruce up your space, contact us here.